Looking forward to seeing her and welcome to Purrs. I opened the carrier to fuss her en route (well we were stopped at the time in a services not literally whilst travelling) and she seems adorable. So glad to hear little Lily-Pumpkin is settling in so well and look forward to photos, it was a shame we couldn't see any of her other than her little nose in the carrier but she was a little gem. 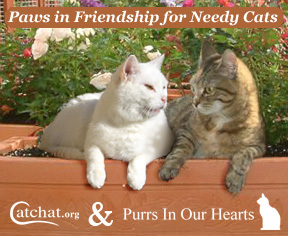 You're both lucky to have found each other - has your other cat met her yet? Glad Lilly-Pumpkin is settling in well. Thank you so much to the very kind people that transported Lily-Pumpkin to her new home, and yes her new double-barrell name has stuck! She has settled in very well and is such a sweetheart. She is currently trying to climb up my leg to sit on my lap whilst i am at the computer. I will try and post some pictures of her soon. Thank you so much. I feel so happy for little Pumpkin and really think this will now be her forever home. Therese sounds so lovely! I would love pictures if this is at all possible. thank you so much for your help, I really thought it was all going to end in disaster given Pumpkins problems. Please thank all the transporters, Therese and of course thank you! I really cannot thank everyone enough. I love the fact that we seem to have apoted both her names. And a special little girl like this deserves a nice fancy double barrelled name like "Lilly Pumpkin"
I noticed that too - Lilly Pumpkin it is. Looking forward to updates from Therese. I do hope we get to see a lot more of Lilly Pumpkin - she is a sweetheart and really is special. I'm so glad she has been given the chance to have a normal life. When we got Lily Pumpkin out of the carrier at Banstead, the towel was all wet and I assumed it was because of her bathing session at Northampton - but of course it could have been another little accident - left that one for the new owner/slave!! Such a little sweetie and the new owner is very experienced with special needs cats and has one with very similar problems as Lily Pumpkin as well as a blind cat. The vet the lady uses in Banstead, I know and he is excellent so I think with her owner and her vets, Lily Pumpkin will be in very good hands and have the best possible care. The new owner will be posting pictures and an update in the next few days. I did bring a coule of spare towels with me ... just in case of accidents It was quiet funny when I was bathing Lilly Pumpkin in the service station ... one lady walked pasted me .. did a double take and said "Oooh not something you see everyday "
At least it was near the end of your part of the journey and a service station. I was also prepared for the worst and it never happened. Poor little love. Hope she's settled in okay at her new home. Hi Guys sorry for not logging on last night ... I went straight round to my friends when I got back home last night (it was about 7:00 when I got back to Nottingham!). It was lovely to meet you all. The kitties where so well behaved and so quiet it was an absolute pleasure transporting them .... I'm so used to having my guys in the car yowling at the top of their voices I forgot not all cats do this! LOL. The journey from J23 to J15 was all going well until just past J16 when my car was suddenly filled with the most stomach turing smell ... Lilly Pumpkin had had a smelly runny poo in the carrier. As soon as we got to J15a services I unzipped her carrier and discovered the poor little poppet had got poo all over herself ... but after a quick trip to the ladies loo and wash in the sink and a new towel in her carrier she was alot happier. Unbelievably throughout all the drama Bilbo the little black cat was sound asleep .... when we got to Amy's I actually had to give him a poke to wake him up Definetly a very good traveller and a very chilled little boy. I'm sure both furbaes will be happy in their new homes . Well done everyone. Nice to meet you Sam (even if it was a quick hello and goodbye) See your other charge got there ok as well - well done. Thank you to everyone concerned - another example of Purrs working together to help cats! Just arrived back home - Pumpkin (AKA Lily) arrived safely at her new home in Banstead and left her exploring the spare bedroom which had been set up for her. Absolute poppet all the way from Northampton. No little accidents in the carrier but I'll let Sam tell you about that one. The new owner or should I say slave will log on in a day and so to give an update. Just arrived home (because we went shopping then to see my dad) met Sam at 3 so all went well and both cats never made a sound all the way there. I did feel like catnapping those gorgeous 'black' kitties although just wished I could have seen them properly but hard to see them through the carriers, and nice to meet Sootyca and Sam Sorry didn't get your text messages 'til later Sootyca, I only received them after Sam's and the first one came after the second which was strange, it's a new phone and no idea what's going on. Kimberley was indeed sorry to see her go. I got the impression she's an exceptionally happy little thing. First leg done safely and me back home. Think Kimberley, the girl who was looking after her was sorry to see her go....and I don't blame her. She is a total sweetie and I could easily have catnapped her. Stopped a couple of times - once because she managed to get hold of a plastic bit that was keeping black cat shut in and she let out such a yowl I thought she had hurt herself. I then moved her into the front of the car where she was happier. Opened her carrier at another services so she could have a nosey (well, she couldn't get out but she could have a proper look and smell. She was much better travelling after that. She's a real love and the home she is going to will be very lucky! Thanks Sootyca. And thanks everyone, hope the transport run goes well. No its okay - she said she knew Pumpkin was going but thought it was the end of Feb! She was told it was either this Saturday or the last weekend of the month, and I emailed earlier for confirmation. Sorry she hadn't checked her messages, glad it's sorted. EDITED TO ADD EMAIL: "The potential dates for transporting Pumpkin to her new home are this Saturday or the last weekend of this month. (Depending on how fast the people can organise the chain.)" Response: "Wow that's quicker than I thought. Like I said you choose a date and I'll make sure I'm available." All sorted now for Pumpkin, other than the layby issue and I need a phone number for Janeyk! Poor lady who has Pumpkin now wasn't aware that she was going tomorrow!!! Fortunately she is okay with her being picked up at the time we needed her so all should be well. Both cats are travelling in their own carriers so don't need anyone to bring another carrier with them. I'm putting a cover in my car, just in case the cages are the wire ones and are open - may be something for others to think about bringing along. I'm just looking at Google maps and can only work that one out as the third turnoff!!! Help? Coming from the north, I come off at Jct 36 - the first turn off looks like it is the A61 and takes me to a smaller roundabout. The second takes me back on the motorway and the third is over the motorway and the fourth is the northbound entrance. No that's the 4th turning - you want the third. Trying to get my route sorted so I know which cat gets picked up first!!! Excellent. We just need to make sure the Northampton lady is okay having her cat on Saturday and that I can pick both of them up on Saturday morning! Janeyk, that sounds fine. I'll text you my number tomorrow - left my phone at work and I haven't a clue what my number is! Sam - Seen your post on the other thread - 4pm to 4.30pm is fine. I'll pm you with my mobile number and car details. So see you on Saturday at Junction 15a Northampton services Southbound. If Sam is OK to stop off at Junction 15a Northampton services to transfer pumpkin to me and then deliver this cat to its new home in Northampton afterwards, I can be at the transfer point at around 4pm. Do we need sam to confirm that timings are ok with her? If you come off the junction at Barnsley J36, at the roundabout take the third exit and there's a layby just on your left, I'll pm my no in case you have any problem. Which direction will be travelling to Barnsley Sootyca? The theory is I will be on the M62 and then go on the M1 so I will be travelling southbound. I can go down further than Barnsley if that is easier? Around 4pm would be fine for me. Perhaps Sam could stop off to transfer Pumpkin to me first (Junction 15a services southbound) and then take the other cat to its home in Northampton. She would be on the M1 anyway. That would minimise those add-ons and I could get on my way to Surrey. Sounds ideal if Sam is happy with that. Doesn't seem much point in taking Pumpkin into Northampton to take her out again! It should only take 2 hours to get from Barnsley down to Northampton (well, that's on a straight run with no hold ups, detours, stops to exchange cats etc). That would mean pickup for you Edd about 4ish and you should be down in Banstead by about 6pm, not allowing for any hold up on your leg. 2pm at Barnsley will be okay with me. Would prefer it to be earlier as roads would be quieter but it's not a problem. The following timings are quite rough but if everyone is okay with them we are almost organised! If not it will be a rethink! So, 2pm Barnsley - let me know where is best for changeover.